All transactions are safe and secure with a reliable history in online purchasing behind each of our associates. 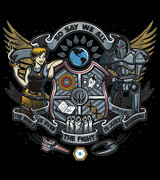 Buy the Galactica Battle Crest t-shirt to own Battlestar Galactica clothing and merchandise. This impressive crest design features various elements from the Battlestar Galactica TV series, including a cigar smoking Kara "Starbuck" Thrace, a Cylon and a Viper spaceship. Wear it as you chant the popular quote, "So say we all!" to demonstrate your devotion to the show. These Battlestar Galactica t-shirts are a fitting tribute and perfect for fans who can't decide on one of the more specific designs. In addition to the Galactica Battle Crest tee above, browse the Battlestar Galactica Clothing Gallery for more apparel like men's and women's clothes, kids shirts or hoodies.